It sure has been stormy in DC lately. Going from the sunniest, hottest afternoons, to windy, thunder-clad evenings in 30 minutes or less truly makes for an exciting closing shift at Pleasant Pops. If you've ever spent a few hours in the cafe you'll know how glorious it is to watch the weather through our window-filled walls. In the winter it’s charming to sit with a hot-pop, listen to A Charlie Brown Christmas and watch a snow storm, and in the summer it’s refreshing to enjoy the air conditioning, guzzle down a blueberry lemonade and devour a Tangy Peach Salad. What’s that, you ask? Well, it’s one of two brand new menu items available now for lunch and dinner. With peach season steadily rolling in, we’re so excited to bring them back as a featured ingredient on our menu. The Tangy Peach salad is both sweet and tart, delicious and healthy. 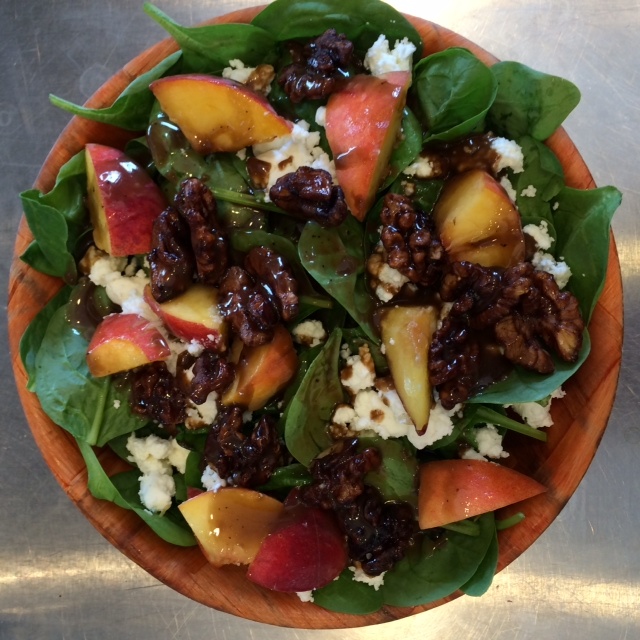 Sitting on a bed of spinach we add freshly chopped peaches, candied walnuts, a generous scoop of goat cheese and some house made yogurt-balsamic dressing. It’s quite the hearty salad and pairs quite well with a muggy summer night. The second addition to our menu is an updated version of the Romesco & Roasted Cauliflower sandwich. Now some say that cauliflower is the new “hip” vegetable (move aside kale), and when we mount ours atop a spread of house made romesco sauce and add some picked red onions, it’s totally scrumptious. (Romesco sauce, for those yet to be introduced, is a tomato sauce made with almonds and herbs to give it a nutty, and slightly spicy, kick.) Unlike our spring version, this sandwich is served on a bulky piece of toasted baguette making it, dare I say, my favorite Pleasant Pops sandwich to date. As summer is upon us we’re thrilled to be using fresh, local fruits both for our menu items as well as our pops. If you haven’t tried our new Blueberry Lemonade yet, make sure you swing by soon and give it a go (it pairs shockingly well with our black iced tea for a perfect Arnold Palmer). With new pops popping up each week (think Blueberry Pancake, Watermelon Mint, and, coming soon, Peach Hibiscus), it’s a very exciting time to be a pop shop. Finally, if you’re in town this weekend, make sure you swing by the West Elm in Georgetown where they’re celebrating summer with a country-wide Ice Cream Social! From 1-3 pm this Saturday (July 19) you’ll not only get 15% off your purchase at West Elm but a free Pleasant Pop! Sounds like a pretty good afternoon treat to me!